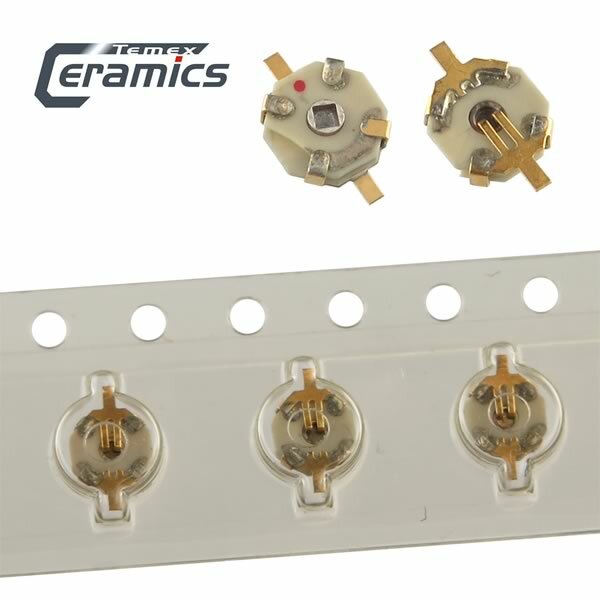 Miniature 0.5pF to 2.5pF SMD Thin Ceramic Trimmer Capacitor from Temex Ceramics France. Rated voltage 250VDC. Typical Q@100 MHz, CMAX is 3000. Has 0.64mm square drive tuning adjustment. Size is 5mm long (including terminations) x 3.18mm wide x 1mm tall. Terminations are gold plated. On tape and reel. Sold in a package of 10.